Sweet To The Soul Ministries - Did I Do That? Ok let’s just acknowledge that God can do anything… He’s God. He created the earth from nothing, and then took the dirt and dust of what He created and created man. 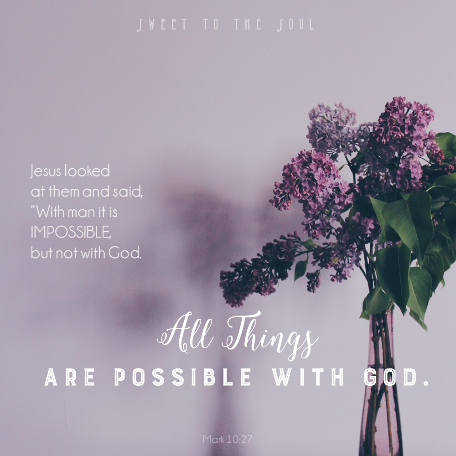 He can do anything… He’s God. However, saving or fixing a situation or relationship might not be about what God can do as much as what I am willing to do…. through God. ​I’m sure you have heard “pray and give it to God, give the situation over to God and let Him fix it”. Good advice, don’t get me wrong; but I have to wonder sometimes, when I do this am I truly surrendering control to God’s will or just giving up my responsibility in the situation? ​My mini-men (2 and 3 year old grand-sons) have a favorite car that both of them like to play with, it has been rolled and raced all over the house. The youngest was playing with it the other night and came over to me to give me the car, and said “ix it”… car in one hand, wheel in the other. So I dutifully reattached the wheel, handed it back to him. A few minutes later, here he comes again, car in one hand, wheel in the other… “ix it”, attaching the wheel and handing it back I said, “be careful with it”. After a couple more times of this new game, I told him to stop taking the wheel off. You see, there was not anything really wrong with the car; he was causing the need for the repairs himself by taking the wheel off. The real solution to the problem was not for me to “ix it” every time, but for him to stop taking the wheel off! Now I’m asking myself, how often do I do just what he was doing? There I am, living in a perfectly good situation or relationship and take the wheel off of it? Either by accident or on purpose, do or say something that causes it to ‘break’ and not function properly. So I pray, go to God and ask Him to fix it, in earnest because I want it to be the way it was when everything was going just fine, great even. But maybe what I need to pray to God for is the insight, knowledge and strength to stop taking the wheel off. True enough that not every negative or stressful situation in which I’ve found myself was due to my choices; many times I have been caught in the wake of someone else’s choices and actions. Whatever the situation, I need to be responsible enough to question and own up to my own accountability. Can’t pay the bills… are the credit cards full but the spending continues? Marriage in turmoil…. is my attention focused on my spouse or something/someone else? Job is in jeopardy…. has the quality of my work deteriorated, yet blame is asserted on others? You see, it’s difficult to correct a situation until we truthfully look at the situation and acknowledge our responsibility. Talk to God, ask Him to reveal what we need to do, or stop doing. Ask Him for the strength to accomplish this and He will provide empowerment. I may not be able to change the circumstances. I may not be able to change the other person. But through God and with God, I can change me. ​Soul Friends is a group of Christ loving women who want to share their #graciouswords and stories of God’s greatness and blessings in their lives with others. So join us here, and make not just new friends, but #SoulFriends. Jana, how hard I seem to think it is to "ask Him to reveal what I need to do, or stop doing." I'm probably afraid of the answer :) Thanks for encouraging me today. Oh it is so difficult for me to ask that question! The answer is never what I want to hear, but God is gracious and faithful to always answer with what I need to hear. Blessings sweet friend and thank you for linking up today! Thanks for inviting me to your link up!!! Great post and encouraging! Love when you say -> it%u2019s difficult to correct a situation until we truthfully look at the situation and acknowledge our responsibility. It's so important to acknowledge responsibility that we have in our marriage, jobs, ect. We must do our part and see the things from other perspective. What a great comparison of removing the wheel! My nephew is constantly knocking down the bridges on his Thomas train tracks and asking for it to be fixed. Another great thing is that even though we often get a little impatient with our little ones when this happens (or atleast I know I do! ), our Father doesn't get impatient with us when we come to him for help, he gently nudges us towards growth. His character to both give us grace and desire to transform us is amazing. Nice to meet you Jana! Good stuff. Very good word. Sometimes we are the problem. We are in need of His wisdom.